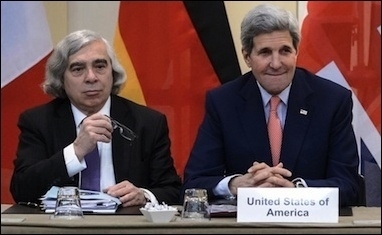 Secretary of State John Kerry (right) and Energy Secretary Ernest Moniz are determined to implant the imprimatur of the United States and the United Nations on Iran's nuclear program. Let's come clean. Let's finally recognize the so-called Joint Comprehensive Plan of Action (JCPOA) for what it is -- a laundering project designed to legitimize Iran's nuclear weapons program. Like a money-laundering scheme by which illegally-earned or stolen money is cleansed or laundered through a legitimate business, Iran's illegal nuclear weapons program is being cleansed and validated before the world's eyes at the behest of the Obama administration. The goals of the diplomatic process have changed tremendously from the beginning when President Obama regularly claimed that an Iranian nuclear weapon is "unacceptable" and that only his unique brand of personal diplomacy could prevent it. At best, the JCPOA delays an Iranian nuclear weapon by 10 to 15 years. But now, even the most generous (or naive) reading of the deal acknowledges that, at best, it delays an Iranian nuclear weapon by 10 to 15 years, after which the Islamic Republic of Iran emerges with a full-blown legal nuclear weapons program. Rather than "prevent" or "block" Iran from acquiring a nuclear bomb, as the president and Secretary of State John Kerry falsely claim, the deal assures Iran of legally acquiring one. It is like telling a jewel thief caught red-handed that if he stops stealing jewels for 15 years, all charges against him will be dropped and he can keep his ill-gotten booty. Although much of the public debate has centered on the details of the restrictions that will be dropped in 2030, many people believe that Iran will cheat on the deal. And since the ultimate arbiter of Iran's compliance with the JCPOA will be the United Nations, it is fair to assume that its record of failure will continue. This seems very probable, as it is Iran that will present much of the evidence to "prove" that it is in compliance. 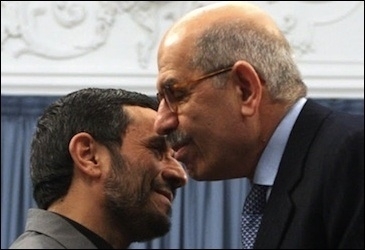 Past IAEA monitoring of Iran's nuclear program was hamstrung by the unwillingness of then-director Mohamed ElBaradei (right) to confront the government of President Mahmoud Ahmadinejad (left). Regrettably, since the beginning of the century, when Mohamed ElBaradei was the Director General of the International Atomic Energy Agency (IAEA), Iran has made significant advances in its covert, illicit nuclear program. As Iran played cat-and-mouse games with the inspections, ElBaradei studiously avoided confronting the regime and soft-pedaled its violations of the Nuclear Non-Proliferation Treaty. For this work, ElBaradei was awarded a Nobel Peace Prize. Some critics of the deal cite Ronald Reagan's advice to "trust but verify." However, the verification process involves a 24-day waiting period between requesting an inspection and gaining access to an Iranian nuclear site. Some commentators are placated by the claims of Secretary of Energy and Obama diplomat Ernest Moniz that 24 days is insufficient to hide the kinds of work that Iran has agreed to halt. But after first learning that only IAEA inspectors will be allowed to inspect sites, it was revealed that none of them will be Americans, and we have now learned that only Iranian inspectors will be allowed at crucial military sites such as the Parchin complex. That looks like too much trust and too little verification. The exact contents of the JCPOA remain a mystery even to U.S. officials. Another objection often cited is that no one, including John Kerry and Ernest Moniz, even knows what the JCPOA is. The exact contents of the JCPOA deal remains a mystery, much like the fictitious fatwa banning nuclear weapons that was allegedly issued by Ayatollah Ali Khamenei, and is frequently cited by Obama -- yet has been seen by no one. Parts of the JCPOA are hidden, not only from the public, but even from American diplomats, as Susan Rice, the U.S. Ambassador to the UN, admits. Ernest Moniz dismisses our willful ignorance of the JCPOA's terms as standard operating procedure, and John Kerry says we must respect the process that allows the IAEA and Iran to have secret side deals undisclosed to any of the P5+1 signatories. But these terms make the JCPOA deal unknowable. Signing it is not an act of diplomacy; it is surrender. Iran acquired nuclear technology in 1957 through the U.S. Atoms for Peace program. Recipients of the Eisenhower Administration's nuclear largesse were required to sign the Nuclear Non-Proliferation Treaty (NPT), which is regularly updated with various safeguards and protocols. By weaponizing its nuclear program, Iran has violated every agreement it has signed. The JCPOA is rewarding these violations. It also signals to all countries, good and bad, that now is the time to break treaties with the U.S., when the likelihood of a serious response is low or absent altogether. Surely Iran's leaders have noticed the U.S. response to Russia's violations of the Budapest Memorandum, its invasion of Ukraine and the Crimea and its moves in the Arctic Circle. Surely, they have also noticed the U.S. response to China's construction of islands that are military bases throughout the South China Sea. So while it is unlikely that Iran will suffer any consequences for cheating (assuming the U.S. even learns of any offenses), there is almost no reason to cheat. The terms of the JCPOA are so one-sided that soon Iran will emerge with all the nuclear weapons it wants, as well as intercontinental ballistic missiles to deliver them to the "Great Satan". And then it will be too late. It's hard not to conclude that the JCPOA was designed to ensure that Iran gets a legitimate nuclear weapons program. There is only one flaw in the JCPOA laundering scheme. In a true money-laundering scheme that involves an outlaw and a legitimate party, the money launderer receives a fee for the service provided; in this trade, the U.S. earns nothing from the JCPOA. The U.S. does not even get back one of the Americans held hostage by Iran. Iran will not admit to any culpability for murdering Americans around the globe, much less pay reparations for them. There has not even been a perfunctory, empty promise to cease funding terrorist groups and threatening genocide against Israel and America. It is hard not to conclude that the JCPOA was designed from the beginning to ensure that Iran would get a legitimate nuclear weapons program, confirmed with the imprimatur of the United States and the United Nations. What remains unknown is why the president and most of his party want a nuclear Iran.